Multi-channel Marketing, Cloud and Containers - A Lifeline for Traditional Retailers? Many of us feel the same way: We love shopping at places like Nordstrom and appreciate their impeccable collections of stylish fashion. But more and more we are buying anything and everything online, including latest fashion. Yes, we know, we are feeding ever larger companies like Amazon Marketplace, but how can you beat their assortment, convenience and the might they have built? 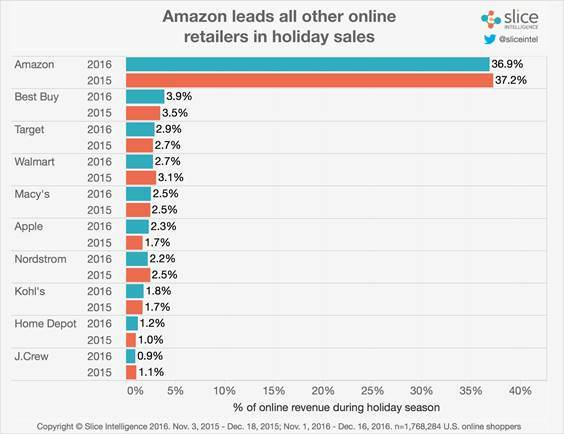 Slice Intelligence looked at 2016 holiday sales and shows Amazon taking a whopping 36.9% share of total sales with Nordstrom taking 2.2%, down from 2.5% last year. And even Walmart lost, closing 2016 holiday sales at 2.7%, down from 3.1% in 2015. - Slice talks about "A new digital divide". Overcoming the New Digital Divide: A Call to Action for Retailers ... and everybody else! I think most of us will agree that we have experienced each of these concerns in our own past projects before, and often not just once. - But despite these concerns by several ShopMore senior managers, the company decides they have no choice but to kick-off their digital transformation project. Instantly provision as-a-Service resources without delay and no upfront cost. Scale resources up and down during your project as needed for various development tasks. Seamlessly move from Dev/Test to Production. Multi-channel marketing, so all retail channels are always in sync. Hyper-scale public cloud, for getting the project started immediately, turning CAPEX to OPEX and most importantly provide the elastic IaaS foundation to scale the retail systems up and down with business demand. A managed service or self-service that makes it easy to consume these pieces as assemblies rather than having to integrate all these capabilities themselves. 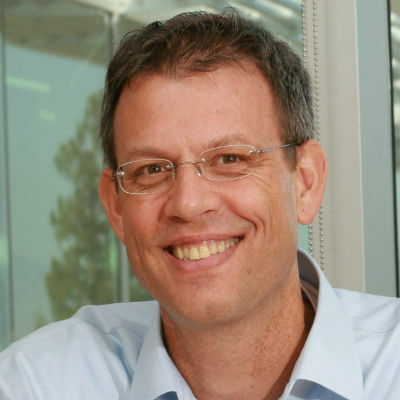 ShopMore is also looking at Container technology and cloud orchestration, adding real-time system agility and scalability to ShopMore's big data workloads. - I will write about this in a later blog. You browse on ShopMore's website on your PC but get pulled away. Later you have a look at the ShopMore site on your mobile phone and are excited that your shopping cart from before shows up. You continue shopping and place the order. You found a nice sweater online but would like to try it on before buying. ShopMore's system shows you inventory in store's close by. To avoid any customer satisfaction issues, inventory shown online needs to represent true store inventory. Another requirement for a multi-channel marketing solution. Retail businesses have demanding IT system requirements driven by business seasonality, frequent introduction of new inventory, out of stock situations and most importantly the unpredictability of the online and in-store customer patterns. Imagine Black Friday or Christmas with its flood of online transactions. Having to provision on-premise infrastructure for these peaks would require a significant investment with idling capacity for the majority of the year.Leveraging elastic public cloud for this allows a retailer to always adjust with business patterns. Or imagine the ability to adjust system availability for Black Friday by provisioning a high availability cluster at the push of a button and stopping such a cluster when online and in-store traffic goes down again and the risk and cost of a system failure is significantly reduced. Public cloud, when used in a cloud native fashion, configured and automated accordingly can deliver all of this at the push of a button. But be warned, Alan R. Earls on TechTarget states, "[Cloud] redundancy, DR set up [is] no piece of cake." Fast assortment change online, enabled by multiple content releases per day. Public cloud for high performance, elasticity, flexibility and security. We will be highlighting this showcase at Container World 2017 in Santa Clara this week. Business and technology is evolving at lightning speed. Some companies are able to take full advantage of it, some others are struggling to keep up.Trying to succeed in such a competitive business environment by using the same IT tools and methods as 5 or 10 years ago may not be the right answer, especially when the leaders like Amazon have reinvented the industry and set standards for online retail and business solutions using big data and being powered by sophisticated public cloud Infrastructure-as-a-Service. Public cloud is becoming more and more powerful by the day. Both Azure and AWS now offer around 100 distinct cloud services to their customers. More are being added frequently. While I covered a lot of ground in this blog, it is only the beginning of many blogs we plan to write on this and similar topics, so stay tuned. With the first iteration, I wanted to alert you to the abilities and opportunities provided by public cloud for challenging workloads and business like retail. And while every business is different in its details, key concepts of seasonality, elasticity, on-demand consumption apply to all business and industries equally.I would love to hear your thoughts. Thanks for leaving your comments below. Please also download our whitepaper that dives deeper into the topic of transforming a retailer to compete in our digital world. Please let me know your thoughts and comments about this blog below! - Where does your company stand in getting over the "New digital divide"?